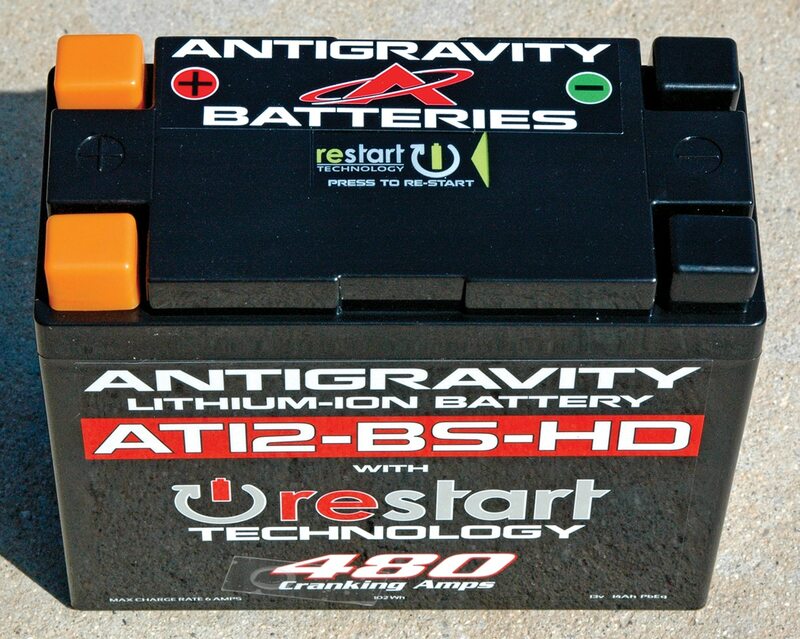 Antigravity’s new Re-Start (RS) batteries are the first to offer built-in jump-starting ability. Antigravity claims that Re-Start batteries continuously monitor their charge level and go to sleep with enough energy to start your machine before going completely dead. Like Antigravity’s other lithium-ion batteries, Antigravity’s new Re-Start batteries provide more starting power, lighter weight and the option to use a smaller battery than conventional lead-acid batteries. Antigravity has several direct-fit Re-Start batteries for smaller UTVs, and more on the way for larger models, as well as many direct-fit sizes for ATVs and motorcycles. The ATX-20-RS fits the Can-Am Maverick Trail 1000 DPS perfectly and produces 680 cold-cranking amps, considerably more than the original lead-acid battery’s 270 cold cranking amps, and it costs $320. For this test, we tried the smaller, lighter ATX-12-HD-RS in the Can-Am Maverick Trail 1000 DPS. It has the Re-Start feature and 480 cold cranking amps, which is still more than the stock battery. It’s $260. On the Can-Am Trail, the battery hold-down covers the Re-Start button on the top of the battery, so you should carry tools to remove the hold-down to access the Re-Start button or drill a hole in the top of the hold-down to reach the Re-Start feature. The ATX-12-HD-RS’ case is somewhat smaller than the stock battery, but we padded the battery hold-down bracket with the packing foam supplied with the Antigravity battery to achieve a good fit. All Antigravity Re-Start batteries have four terminals on the case rather than two, which simplifies custom installations and wiring accessories directly to the battery. No matter how you install the battery, you should cover both positive terminals to keep the battery from shorting to ground in case metal objects reach it. The battery comes with covers for all the terminals. 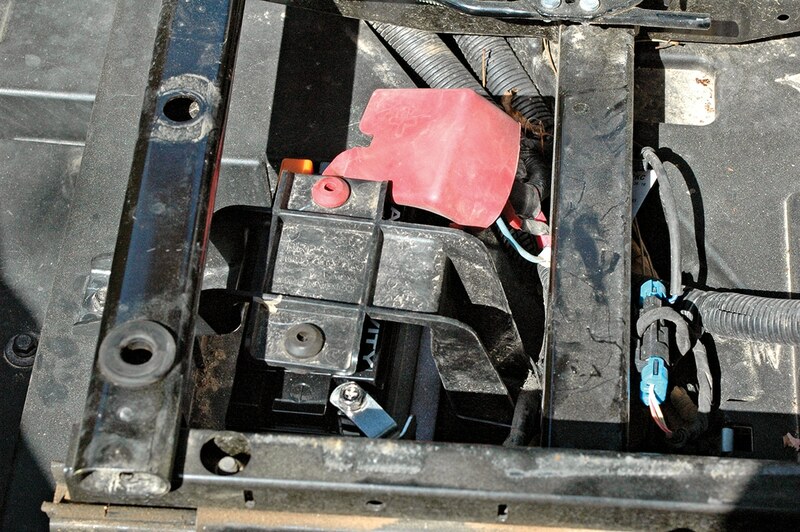 The Can-Am’s battery hold-down covers the Re-Start button on the top of the battery, so you should carry a 10mm socket and driver so you can remove the hold-down to access the Re-Start button. You could also drill a hole in the top of the hold-down to reach the Re-Start button without tools. Antigravity will soon offer a remote key-fob button to activate the Re-Start feature. First we tested the battery for normal operation, and it started the Can-Am 1000 repeatedly with all the starter cranking speed of the fully charged stock battery, then we left the headlights on to simulate an accident that would kill the battery. Left unused, most modern UTVs will drain a battery eventually because of the small, continuous draw from the clock and engine-control computer. Once the battery was drained so much that it was unable to start the engine, we pressed the Re-Start button and the Can-Am cranked to life. Even though Re-Start batteries provide built-in jump-starting, Antigravity recommends using a charger made for lithium batteries for long-term storage. Antigravity’s Re-Start batteries prevent dead batteries from ruining a ride more effectively and conveniently than any other kind of battery we’ve used, and the remote Re-Start button will make them even easier to use.